Zach Harrison couldn’t have acted more nonchalant. He might have been nervous or anxious, but he didn’t show either emotion. Sitting on the Olentangy Orange High School auditorium stage beside his parents and sister, he was in total control. The five-star prospect with scholarship offers from every football powerhouse across the country wore a zipped-all-the-way-up U.S. Army All-American Bowl jacket to hide the t-shirt that would soon reveal his eventual college choice of Michigan, Penn State or Ohio State. Looking into the hundreds of classmates, teammates, teachers and alumnus that packed every seat, Harrison knew his decision, which he would soon reveal to the world. Only a small amount of people knew which college he had chosen. Three of Harrison’s fellow seniors – Jacob Lipperman, Max Brunke and Tyler Ross – were among those select few, and they were much less calm. The notoriously tight-lipped Harrison only allowed one media outlet – Orange Sports Live, a student-run property created two years ago by Lipperman and Brunke, and soon after joined by Ross – inside the school to broadcast his announcement. By the time the commitment ceremony began last Wednesday, their work of preparing to live stream the event for tens of thousands of people was already complete. No more running around. No more adjusting camera positions. No more hooking up the live stream. When Lipperman, whose legs were “dead,” plopped into his seat up front behind Harrison’s family, he had one thought: “'Damn, I hope we have audio.” He quickly got his answer when he pulled up the live stream on Periscope with the event about to begin and the sound blasted from his phone. Relief set in. The major question had been answered. Still, though, having hatched the idea just 24 hours before going live, the trio of Olentangy Orange seniors remained stressed. They were still concerned about audio and had to hope the thousands of viewers didn’t crash the stream, but they finally began to see the results of what they had tirelessly prepared for. As the ceremony began, the Orange Sports Live crew was partially focused on what was happening on stage, while remaining locked in to the Periscope stream that was being directed by a fellow classmate, Brooke Little. “All I see is 62-39 running through the comments,” said Lipperman, referencing Ohio State’s win against Michigan. “Over and over again,” Brunke said. First, Olentangy Orange athletic director Buck Weaver spoke, running down the itinerary. Harrison, the No. 4-ranked recruit in the country, took the podium next to thank everyone involved in his recruitment. “I had a speech written in my pocket, but I think I’m just going to wing it,” Harrison said, generating laughter from the onlookers. Zebb Schroeder, Olentangy Orange’s football coach, followed Harrison, congratulating his star player and offering words of wisdom pertaining to his future. Once he finished, Harrison stepped up to the stage again, first pulling down his jacket as he stood up to ensure no one saw the color of his t-shirt. Jacob Lipperman created this graphic for Zach Harrison to tweet when he committed to Ohio State. Courtesy: Max Brunke. The packed crowd’s eruption nearly blew out the boom mic, Orange Sports Live’s backup audio option that it had to go to midway through the live stream. “I'm going to be completely honest, as soon as 'The' came out of his mouth, I was trying to hold back tears,” Lipperman said. Lipperman and Brunke started Orange Sports Live in October of 2016 with no intentions other than tweeting scores of their high school’s games. They simply wanted to solve a problem that they didn’t think should exist. Brunke remembers exactly where he was when he realized what was missing from the digital ecosystem. Though he didn’t attend the Pioneers football game against Westerville North on Sept. 30, 2016, he was interested in the result. However, he couldn’t get any of his friends to text him the score, which “frustrated” him. Jacob Lipperman (left), Max Brunke (middle) and Tyler Ross (right) run Orange Sports Live at Olentangy Orange High School. The account began a slow, gradual growth without any grandiose plans. Eventually, Orange Sports Live morphed into much, much more for Lipperman, Brunke and Ross. The three who run the media venture enjoy using creativity, so that naturally led to them dabbling with graphic design and video editing. They hosted a “media day” earlier this year where they invited athletes from each sport to pose in front of a green screen to use in GIFs and videos during their respective seasons. Orange Sports Live hosted media day to get clips for hype videos. Courtesy: Max Brunke. They cover “every” sport at the high school, though each of them admitted that covering football has been their favorite. On Fridays during the football season, Orange Sports Live’s day began at 7:20 a.m. in Kari Phillips’ journalism class. By the end of the period, the graphic for the game was complete and videos highlighting each player were done. Then, the painstaking process of waiting for the night’s game began. Nearly 12 hours after its day began, Orange Sports Live’s coverage would begin with tweet after tweet updating the account’s followers on each play. 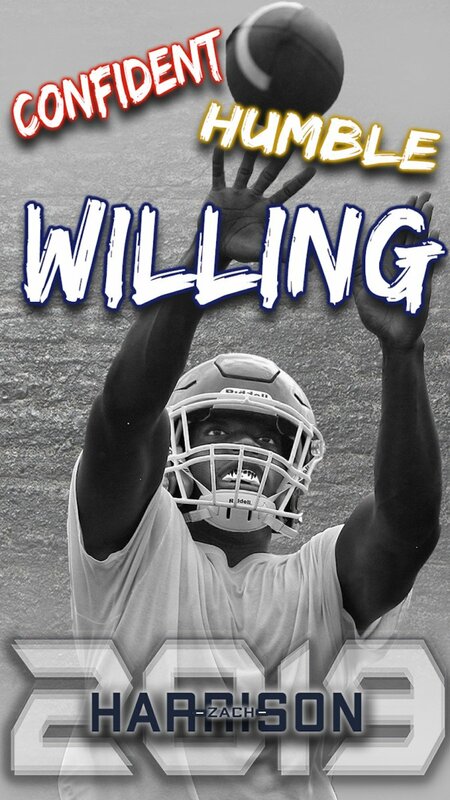 If the games were far away, such as the playoff game this fall at Toledo Whitmer, their importance only grew. Some people unaffiliated with the school followed just to see updates on Harrison, but the crew learned quickly it couldn’t focus on him. A graphic that Orange Sports Live used. Courtesy: Max Brunke. It was hard not to hone in on the player they called “the big man” in capital letters on the Orange Sports Live account, especially considering how well they know him. Brunke grew up down the street from Harrison. Ross met the Ohio State signee when they played together on a flag-football team in second grade. Lipperman became friends with him in sixth grade. Brunke admits it might be “a little creepy,” but he still remembers where he was, sitting in his car at a stoplight on Old State Road, when opened Twitter and saw Harrison had received his first of many scholarship offers. Harrison’s recruitment began to blow up during his sophomore year with the Pioneers, then continued to get bigger, along with Orange Sports Live. Despite having seen the fervor with which fans followed Harrison’s recruitment, Lipperman somehow didn’t realize what he was doing when he sent out a tweet announcing Orange Sports Live would be broadcasting the commitment the following day. Lipperman didn’t even confer with either Brunke or Ross. Neither of them – nor Lipperman, until a few minutes prior – had any idea this would happen. With five minutes left in his math class, Lipperman discretely typed up a tweet and fired it off before flipping his phone face-down on his desk. Almost immediately, his phone started buzzing. And buzzing. And buzzing some more. Lipperman didn’t say a word to his teacher. He bee-lined out the door to call Brunke. Brunke, unbeknownst to Lipperman, was in the shower preparing for his shift at Old Navy. He picked up the call anyway. Brian Nicola, a broadcasting teacher at Olentangy Orange, saw the tweet blowing up and got in contact with Brunke who, still at work, passed him off to Lipperman. Ideas percolated. When Lipperman sent the tweet, he imagined himself sitting in the front row using his phone to stream on Periscope. Nicola had a different thought. He told Lipperman that the plans were in his control, but he believed his students who run “The Juice,” a news broadcast at the school, could help live broadcast the commitment with cameras and microphones. Lipperman, Brunke and Ross, who checked his phone after his government class and saw about 20 texts detailing what he missed, began planning. Lipperman’s night soon got even busier. 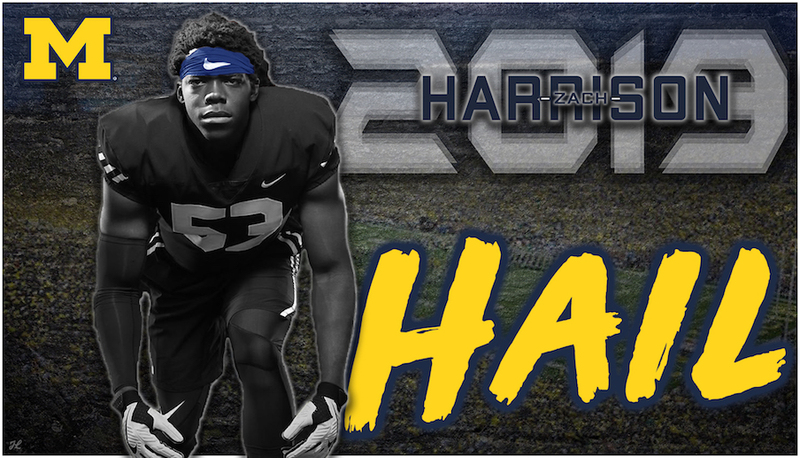 Jacob Lipperman created this graphic for Zach Harrison to use if he committed to Michigan. Courtesy: Max Brunke. At about 7:30 p.m., Harrison texted him about redoing a graphic. Harrison had entrusted Lipperman with creating an image to tweet featuring his selected school, but none of the three graphics were definitive in his choice enough for him. So, in order for Lipperman to create just one new graphic instead of three, Harrison let it slip. He told his friends that he would be a Buckeye, which shocked Lipperman who had seen him wearing a Michigan shirt when the Wolverines played Ohio State and saw him in Michigan gear the following weekend, as well. 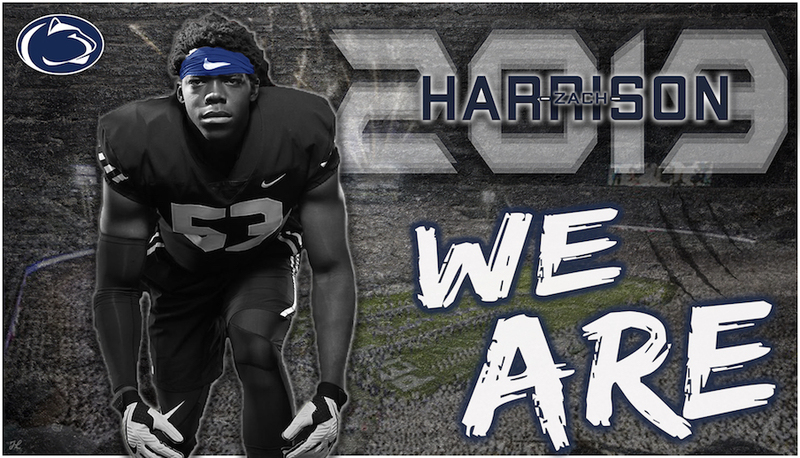 Jacob Lipperman created this graphic for Zach Harrison to use if he committed to Penn State. Courtesy: Max Brunke. With the graphic out of the way, the trio turned its focus back to the ceremony. So many things to do, such little time. Lipperman, Brunke and Ross just tried to stay as calm as they could while considering how best to set up the following day’s operation. Lipperman could “barely” sleep last Tuesday night. Brunke managed just two hours of shut-eye. Nicola suggested coming into the school the night before the ceremony to prepare, but Lipperman shut down the idea, realizing no one would get any sleep, and even the nominal amount mattered. With the commitment ceremony scheduled to begin at 12:30 p.m., Lipperman got to school around 7 a.m. and began talking to Nicola, who told him they didn’t have to go through such a set-up if he didn’t want to. Lipperman and the others, though, were set on making the quality as pristine as possible. With the confirmation, Nicola told him he didn’t think it would be possible to have everything set up until there were about 20 minutes remaining until the ceremony beginning, so the group got right to work. “Long story short, that was the most stressful five hours before an event I've ever had,” Brunke said. An Orange Sports Live graphic featuring Zach Harrison. Courtesy: Max Brunke. Lipperman said he doesn’t really remember what happened next. Too much running around to recollect many specifics of the morning. Nicola had to leave to teach a second-period class. While he was gone, Lipperman “somehow” hooked up Periscope. Then came the cameras, which had to be brought into the auditorium and aligned to the group’s liking. Two hours before the stream began, they realized they needed a “live stream will start soon” graphic, which Lipperman quickly whipped up. No one stopped moving. There’s wasn’t any time to squander. Three technical workers from the school helped Orange Sports Live’s crew set everything up, as well. But everyone forgot one crucial aspect: audio. The audio board at the back of the Olentangy Orange auditorium that was used for the Orange Sports Live broadcast. They decided to start the live stream on Periscope, showing only the “live stream will start soon” graphic, before audio even worked. Without a fix seeming imminent, they set up a boom microphone as a backup. Then, miraculously, someone the theatre teacher called to help made the necessary adjustments on the audio board to get the feed working correctly. “Turned out to be really crucial because he came in with five minutes left and turned a few things and switched a few, and it turned out that we got the main audio that we needed for a while, and then we had the backup plan,” Ross said. Midway through the stream, the primary audio cut out and the boom microphone became the only option. But at least for the time being, audio was no longer an issue. Instead, they could revel in the ever-increasing viewership as they finalized preparations. The station that director Brooke Little sat at during the Orange Sports Live broadcast. By the end of the stream, 42,000 people had tuned in. As of Wednesday morning, 72,800 people had watched the video of Harrison’s announcement. 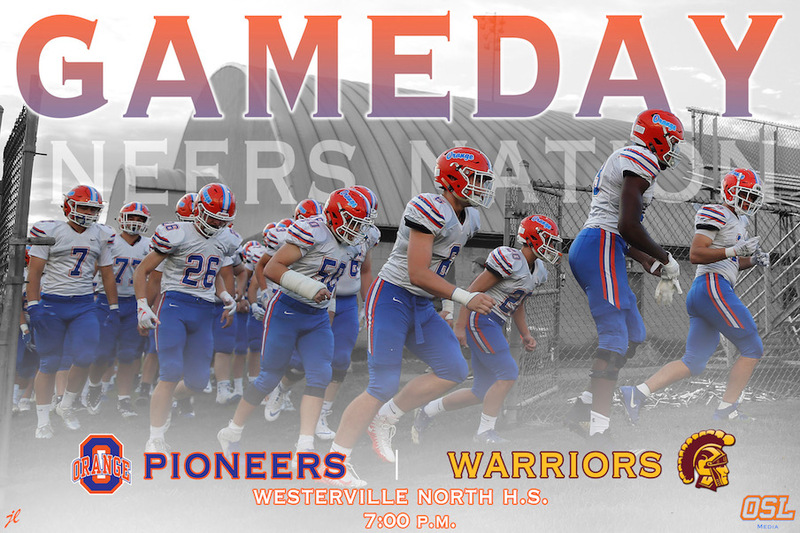 At about 6 p.m. last Wednesday, hours after the operation was complete, Brunke and Lipperman tuned their television to NBC4, where they saw Harrison’s commitment video with the Orange Sports Live logo in the bottom right hand corner. Orange Sports Live's logo. Courtesy: Max Brunke. Athletes such as Harrison don’t come along too often. In Olentangy Orange’s case, an athlete like Harrison had never come along — and already gone. Harrison graduated and will enroll at Ohio State in January. Not too much later, everyone who runs Orange Sports Live will be gone, as well. Lipperman, Ross and Brunke each will graduate this spring. Lipperman expects to join Storied Rivals after graduation. Ross will head to Bowling Green State to play baseball and study business. Brunke will enroll at Ohio University, where he intends to pursue media in some form in the heralded Scripps School of Communication. There’ll be no Lipperman, Ross or Brunke next year, but Orange Sports Live will live on in the hands of a group of students yet to be determined. They admitted it will be "weird" to watch from afar, but they got their day in the spotlight. “The stress paid off,” Brunke said.